I cut the recipe in half and it was enough for at least 12-14 small tacos. Spray a pan or glass baking dish with non-stick cooking spray and lay pepper and onion rings on the bottom. Lay chicken over onions and peppers. In a medium sauce pan, place all other ingredients and heat to a boil. Stir to combine ingredients and remove from heat. Pour the tomato mixture over the chicken. Cover with foil. Place in oven for three hours. Remove the pan from oven and peel off foil. Place chicken on a cutting board and shred with two forks. (It should come apart VERY easily). 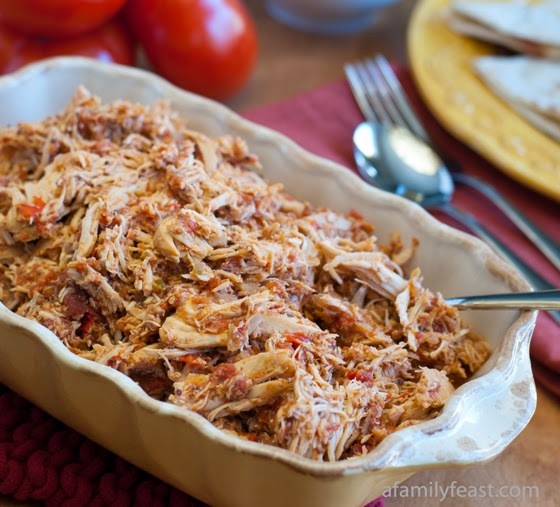 Place pulled chicken meat back in with tomato mixture in baking dish and mix to combine. Look delicious this, thanks for sharing this recipe.